With the choice of internal doors now available, what are the key points to consider before you head off to make a purchase? Although you should always factor in the overall look of your home when selecting internal doors, there are a few key trends which are worth of note. 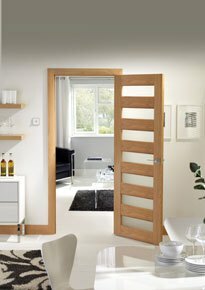 Whilst traditional 4 or 6 panelled doors retain their classic appeal, contemporary style large oak doors and other timbers such as walnut and pine in smooth finishes have become popular of late. Solid and smooth-fronted wood doors in oak, walnut and pine combine both a timeless material with an up-to-date look. Contemporary horizontal panelling is also a stylish new option for timber, as is the use of chrome inlays and fittings. Internal doors with a glazed panel are proving to be increasingly popular, to allow for the maximum amount of light in a home. Today’s designs are cleaner and simpler, in contrast with the fussier patterns of the recent past. French doors are still a hit with consumers, used internally as a dividing wall between rooms, again to create a light and airy atmosphere. 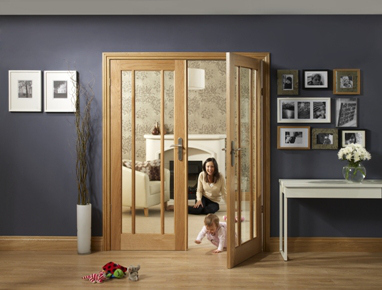 For added flexibility, many people make use of folding doors in a combined living / dining area. These can be solid or glazed depending on preference. If there are budgetary limitations, you may want to choose wood veneer as a low-cost alternative to solid wood. Functionality is as important as attractiveness and you may want to think about options such as certified fire doors for the kitchen or a wipe-clean paint finish for the bathroom. Fixtures need to be considered not only to match the appearance of your doors, but for utility. Choose large handles for doors which are frequently used and think about hinging doors to push inwards into a dining room, to make it easier to carry loaded plates or trays from the kitchen. Metal ironmongery such as wrought-iron and polished steel is on-trend, even for wooden doors, which makes for a pleasing contrast between materials. Although you can buy ancillary items such as frames and skirting boards and fit them yourself, it is usually recommended that you hire a specialist to fit your internal doors. The money spent on the doors themselves is an investment you won’t want to compromise. One hinge or lock cut-out in the wrong place and the door is ruined! 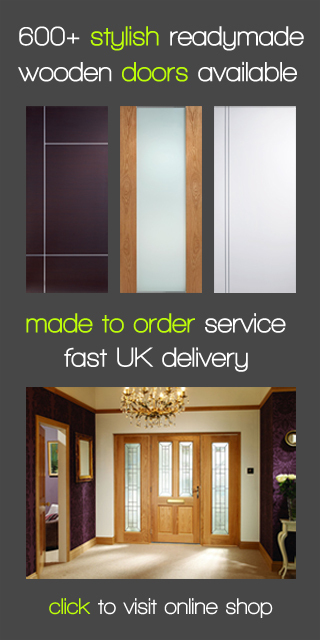 For help and advice on choosing the best internal doors for your home, contact the sales team here at Modern Doors.